I spent yesterday watching Gilmore Girls and today I might attempt some baking or cooking. 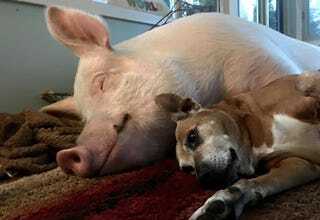 I love this picture of Esther the Wonder Pig and her puppy companion! I’m going to be buying all my holiday gifts from Esther’s store or from the Happily Ever Esther Farm Sanctuary store this year which my dad is pissed about. He hates gifts but he would rather go out to a restaurant. I can buy a medical kit for the sanctuary and it’s cheaper than a meal! Plus I’m taking my mom out for her birthday to a very fancy vegan restaurant, so I really can’t afford lots of meals out. What’s up with you, GT?